Well, the excitement, exhaustion, fun, and all the rest are in the past now, and I have only memories of my month's stay in beautiful Paris, France. I hope, too, my experiences there helped me grow as a person - yes, even at my age! I feel they did. 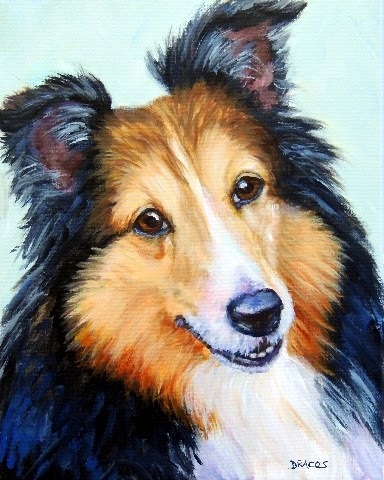 On another topic: I've been receiving several requests daily for custom commissioned paintings for holiday gifts. I have accepted just a few, from repeat clients, but I don't have space on my calendar for more for the rest of this year. 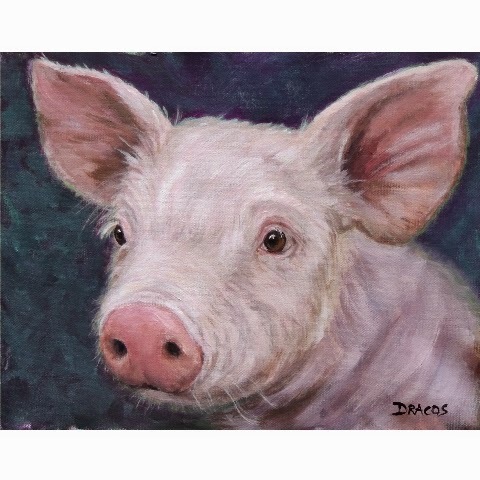 I have several more paintings in the works now, all farm-based as that's what's been on my mind a lot lately, so I'll be posting those over the next week or so. I wanted to add one more thing before I leave: I really liked my apartment here and feel the price was reasonable, the apartment very nice, comfortable, and functional (dishwasher, clothes washer, comfy bed(s), etc. ), and the neighborhood very convenient. With the owner's permission, I am posting his email address here so that if you're interested in renting the apartment from him, you can contact him directly. His name is Alex, and his email address is snowhaze1@hotmail.com. This is my final post from Paris, and it's a bitter-sweet one. I'm looking forward to getting back home and getting back to work, and I'm regretting terribly leaving my little Parisian apartment and this magnificent city. But there's always next year. Read my post in my "Paris Vacation" page -- off to the right side of this post. Here's another update, dated Sept. 27. I've just created a new, long post on what's been going on in my world as I continue to visit Paris for a month. Remember, let me know if you have any questions or comments. Comments on our Louvre Museum visit. I have my computer now and will be posting hopefully daily about my vacation. If you find it interesting, please let me know by commenting. If you have questions or comments, I'll do my very best to answer or address them. So I don't bore others who are only interested in my artwork, I've added a page about my Paris vacation. I post on it pretty much every day, but it doesn't show as a new listing, so check it out daily if you're interested. In it, I talk about jet lag, packing lightly, list of clothing for a month, traveling in general, upgraded tourist seats, what it's like to "live" in Paris for a month, etc. 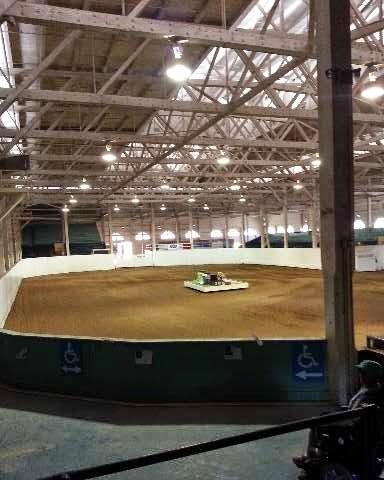 The empty horse arena. It's an amazing building. A beautiful sheep who is going to be in a painting soon. I'll have to find out what kind she is. 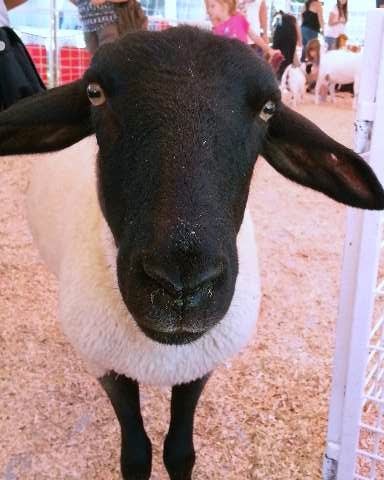 We took a break from everything yesterday and went to the Oregon State Fair, in Salem. It's been something we've done since we moved here to Portland 20 years ago last month, so it has become quite an established tradition. It was the first time we've gone on the opening day, so there wasn't much going on. 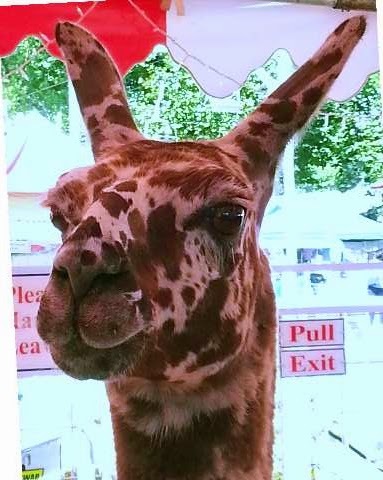 The upside, though, is that all the exhibitors were fresh, not jaded; the animals were clean and not bored out of their minds yet (though a bit frightened at being in a new place), and the entire place was nice and clean. The big downside was the horse arena, where we go every year to see the same horses, the same wagons, the same everything -- and nothing was happening! We saw a few miniature horse competitions, some with only one entrant - who always got "first place" - and that was about it. We ate the same treat as we do every year, a caramel apple, but this year my little granddaughter shook things up a bit: she bought some cotton candy, which everyone tasted and everyone except her, of course, complained that it just didn't taste the way it used to. We all got way, way too much sun, walked -- no, ambled -- way, way too much -- and had a great, great day! I've attached a few photos I took, some of which will become paintings. 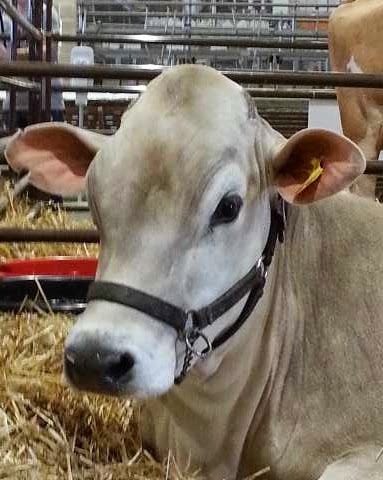 A brown Swiss Cow that I think will become a painting! 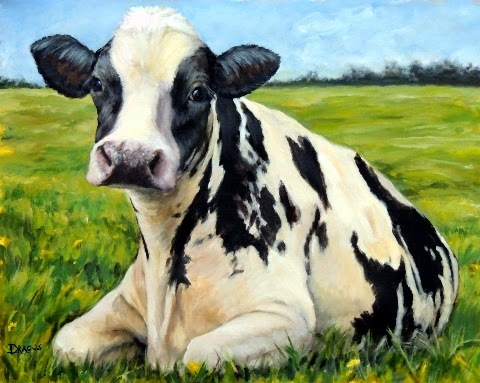 I started a new cow painting yesterday. I haven't been doing much painting lately, and I was starting to feel withdrawal symptoms; so with all I have to do now related to my trip, I started a beautiful Jersey cow painting. 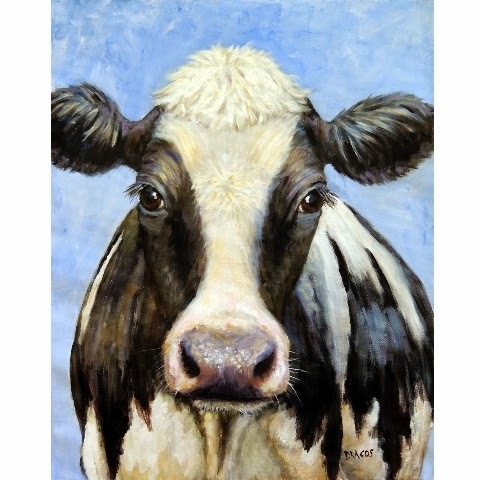 She's a Jersey cow that I photographed a few months ago at a very small dairy farm about 60 miles south of Portland. I don't know if I'll finish her before I leave, but I'll do my best. However, she probably won't go up for sale until I return a little after mid-October. The painting is so far done with acrylic paints on a 16x20x3/4" stretched canvas. If I feel I have time, I might finish the painting off with oil paints. I love the simplicity, speed, and ease of clean-up with acrylic paints, but to "top off" a painting with oil paints really gives it an extra punch of color and vivacity. This is not to say I can't achieve the same results with acrylic paints, but the oils make it a little easier -- and they go on oh so smoothly. 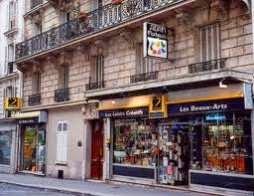 Amazingly, I have found a well-stocked (and reasonably priced) art supply store within a short walking distance from my apartment in Paris. I was concerned about what art supplies to take with me because I'm not checking any bags, and I wasn't sure I would be able to take anything at all in my carry-on -- plus, obviously, I'm going to be short on space, too! So I'll just be buying everything at this shop: canvases, unstretched, of course, but I'm quite adept at stretching my own canvases when I return, paints, brushes, everything! It'll be a lot of fun! I do admit that over twenty years ago, I lived in Toulouse, France, for nearly two years while I did some graduate studies in neuroscience. However, when I went there, I had had no French language education at all -- well, except for about three weeks right before I left, which only made matters worse, not better, because those pitiful three little weeks gave me a false confidence that I knew at least something. But here was the problem when I arrived there all those years ago: I could ask where is something or other --- BUT when the other person responded, I had absolutely no clue about what they were saying!! I bought a French language textbook before I went; and after I got there, I studied it every day, every chance I got. And I got by. That's all I did for at least the first year; I got by. And I might add, too, that almost no one that I knew spoke more than just a few words in English, too, so I didn't have that "out." I found out, too, that hand signals were powerful and that I could live with making a fool of myself, very often! I got by. After having been back in the USA for nearly twenty years, except for occasional European visits, I didn't study French at all until just two or three years ago. Then I decided I was getting old and that I wanted to complete what I had started all those years ago. But still being stubborn and wanting to do everything my own way, I decided, once again, to go it alone. So I started reading everything I could in the French language. That meant, of course, that I had to have a dictionary beside me at all times and that I spent more time studying the dictionary than figuring out what the heck I was reading. And I'm not talking simple books, either: To this day, one of my favorite French authors is Emile Zola. I struggled with his novels, one after another, for many, many months at a time, each one. Not only did I not know the words, but I couldn't even understand the sentence constructions. But slowly, v e r y s l o w l y, things started to fall into place. Progress was very difficult even to measure for many months at a time. But then it really began to pick up speed. Today, I read without a dictionary present -- except for the occasional word I need to know. I found out, too, that I didn't have to look up every single word, even back when I wasn't understanding much at all, because I could get the gist of the story -- and I could learn many high-use words by context after a while. 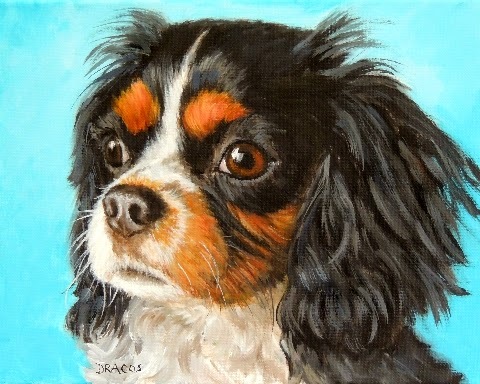 This is a painting I did of a dog I knew many, many years ago. Her name was Sean, and she belonged to a dear friend of mine. 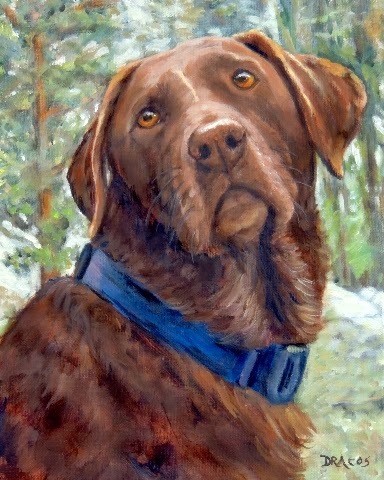 I've always thought she was a beautiful dog, and I have intended to paint her for years -- and finally got around to it. She was a real sweetie. This is Max in his "SpiderMax" costume. He's a weimaraner pup who likes to dress up! It's a custom painting I finished very recently and hadn't had time to upload until now. Obviously, he's sold already! He's a beautiful puppy, I must say. I'm a little closer to being ready to leave for Paris now: I finally purchased my plane tickets. I have for the most part always flown economy class, which is generally okay, being a part of the big crowd of budget travelers -- we all go to the same place, right? But this time I decided that it's worth a few hundred dollars more to at least upgrade my seat to the "economy comfort seats," or some words to that effect. So for my one long domestic flight and my two international flights, I have upgraded to more seat room and silly perks such as ear plugs, a sleep mask, I think a video screen right at my seat, probably a slightly upgraded meal, which I almost never take anyway because I'm vegetarian and almost always buy my meals before I board, and unlimited alcoholic drinks. Being a very, very lightweight drinker, however, I'm afraid I'll have to pass on that one; wish I could have a bit of a discount for not drinking, though. Well, I'll have one tiny glass of wine, though. It's not that I don't like alcohol; my body doesn't like it, and I become ill after more than one drink. Back to the tickets: I'll be sure and report how these comfortable economy seats work out and if they're worth the few hundred dollars more. Most likely, though, anything that gives me more room to stretch out on long flights is worth it to me. And maybe I'll actually have wider armrests, too. That would be really great because for some reason, I almost never get "armrest rights" when I fly. Too timid, I'm afraid. Regarding artwork while in France, as I've mentioned before, I intend to paint while I'm there. As I don't intend to have a checked bag on my flight over, I am taking only a few brushes and some prepared but unstretched canvases. There's a really nice art supply shop just about a five minutes' walk from my apartment there, so I'll go there and buy my paints. I intend to use acrylics only to ensure that everything has dried well before time to return. If I want to add some oil highlights later, after I return here, that will be easy to do, of course. I've been attending an advanced conversation group once a week here in Portland, and it concerns me a bit. I realize just how not-fluent I am in French. I struggle on as I try to engage in quite deep conversations at times, but from the often bewildered expressions on the faces of my "interlocuteurs," I fear that I'm not quite communicating as well as I had hoped. We'll see . . . . .
My greatest fear (after the fear of not getting lost on my way to my apartment from the airport, of course) is that I will "hole up" in my apartment when I arrive, something which I have a tendency to do when faced with potentially frightening situations. But fortunately, there will be no food in the apartment, so I'll be forced to go out at least for some wonderful bread, pastries (bien sur!! ), and some essential groceries. I'm going to do everything in my power to force myself - again - out of my safe zone and go out and explore -- tentatively, of course, at first, but with more confidence as each day passes. I still have several custom paintings that I need to get done within the next few weeks, and then I'll have more time to spend on getting ready for the trip. As it's been such a long time since I was last in France, I have a lot of things I'll need to catch up on, such as how my smartphone is going to serve me there, how to be able to charge all my electronics, which, of course, are now an essential part of every person's life, how to ensure that my debit card works well everywhere (and, of course, how to avoid exorbitant fees for its use). I remember when I was in Denmark a couple of years ago, I was able to use my debit card everywhere, for everything from cash to groceries to parking "meters," without a problem and with little to no added fees. I presume it will be the same in France, but I'll check beforehand to be sure. Just lots of little details I need to cover before I leave. 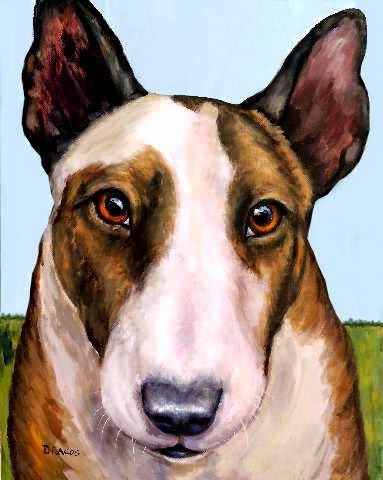 This is a fun painting I recently finished of a sweet looking English bull terrier with a bit of brindle markings. It was a pleasure to paint. I like the sort of dreamy background I put in. 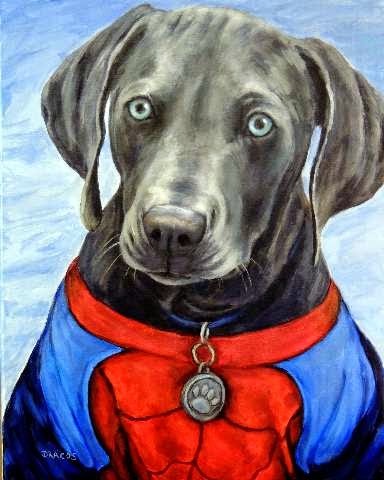 Next I'm working on a couple of custom paintings: A weimaraner in a most unusual outfit! And a really sweet-faced, elderly, mixed-breed dog. They're both due right away, so I'm going to be working hard, hard, hard. Rooster Painting! Something Bright and Fun! 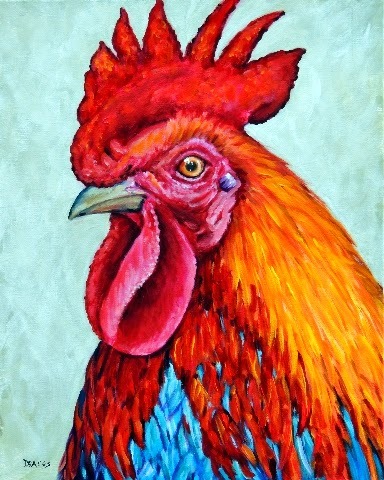 This is a really fun rooster painting I just finished today. He's going to grace my own kitchen until he sells because I love him. He makes me smile; he'll definitely wake me up in the morning even before I've had my first cup of coffee; and he was a lot of fun to paint! The original painting is on 16x20x3/4" stretched canvas, with the sides painted the same color as the background. The background shows up in the photo as a bit blue, but it's more of a greenish grey actually. I'm selling both prints and the original. 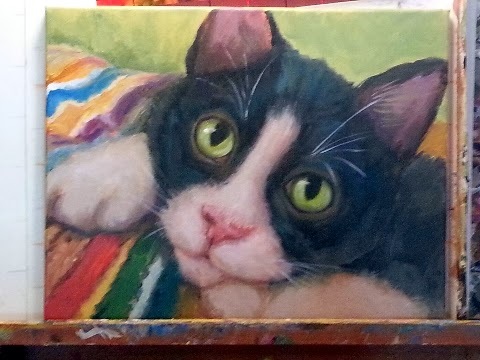 Now I absolutely have to start on my next custom painting, which as I think I've already mentioned, is another beautiful cat. 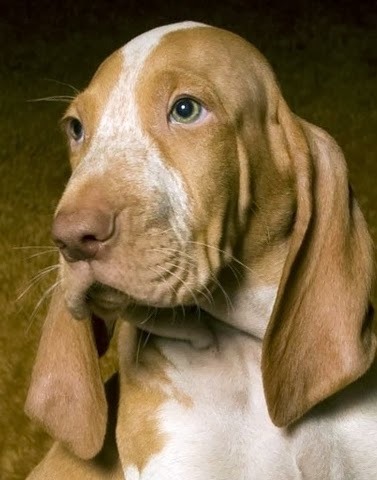 Why do puppies often look so sad? I've never figured that out, but they do. And this little sweetie is no exception. I just finished him today, and the original is 16x20x1.5, gallery-wrapped canvas. I also have prints for sale, of course, as usual. 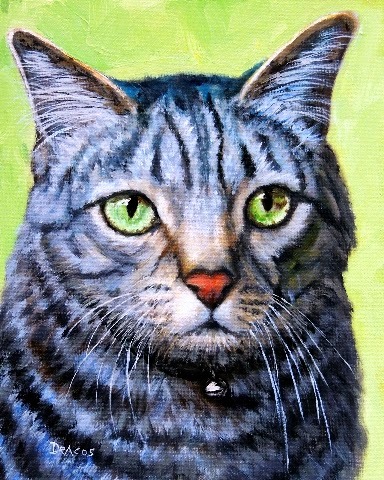 This is another cat painting I finished very recently. He's another custom painting, so the 11x14" original has already been sold. 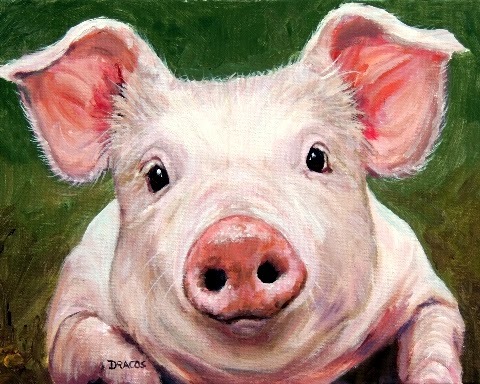 I think he's a beauty, and I'm quite happy with the outcome of the painting. 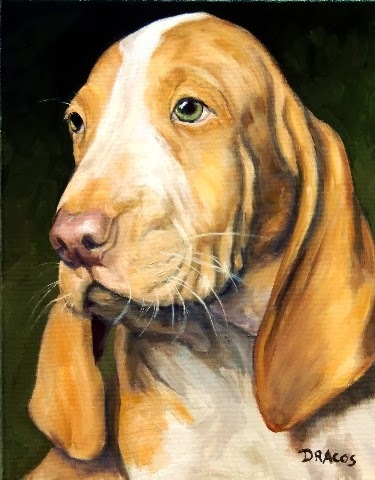 I have another custom cat painting to do and a dog custom painting, which I think is a Weimaraner puppy (can't remember exactly at the moment). Although ceramics are still taking up a bit of my time, I'm getting more and more painting done -- and loving it. Spring is still struggling to take hold here in Oregon. We get a few nice days, then back to nasty rain again. I'll be missing rain, though, in just a couple more months when we get pretty much no rain until late September. Wish it weren't so "all-or-none" here. I still intend to go to France in September and am still excited about it. Just kind of waiting at this point, though. Still don't know how long I'll be there, though. We shall see . . .
We have my son-in-law's parents visiting from Denmark at the moment, and everyone is having a good, but busy, time. My little granddaughter is the most excited as all grandparents I think love to shower little ones with whatever is their hearts' desire at the moment. They're up on Mount Hood for a few days now, and she reports that she's having a grand time! This is a painting I finished a few days ago. Now I wish I had done it in a larger format. 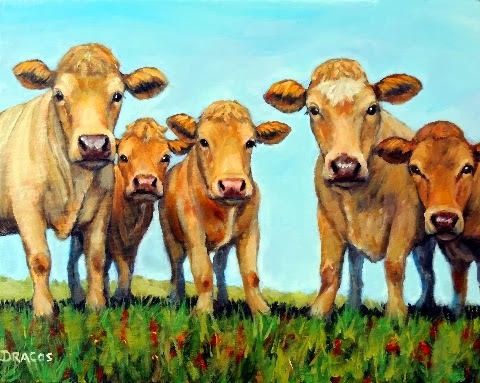 It's five cows on only an 11x14 canvas, so I had to use really, really tiny brushes for too many of the details. However, it is finished, and prints are available. As the original painting is in oil, it is not ready to put up for sale. It should be dry enough in a couple more weeks. Hope you like it. 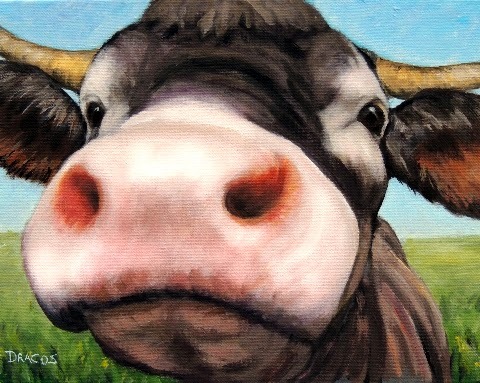 I don't think I'm going to do more than two or three cows to a painting in the future . . . Sorry I didn't post any interim shots; I worked straight through to the end after my last post. He's finished, but I still may tweak him a bit, of course. I always do until they go out the door. Anyway, the original is for sale, and it'll be listed on Etsy, along with prints, in the next day or so. 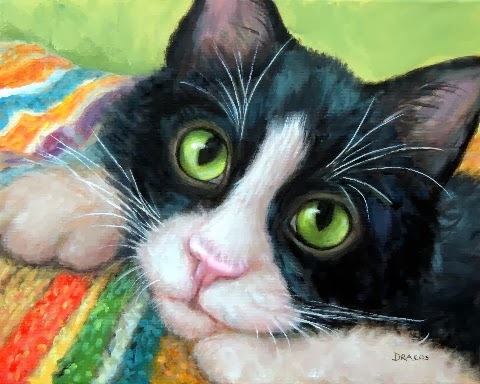 The oil painting is on 11x14x3/4" stretched canvas, with the sides painted the same dark green as shown in the background. I'm pretty happy with him. Oil paint is so much easier to use than acrylics and the colors are just amazing, so clear, clean, and bright when I need them to be and dark when I need dark. But I am having a bit of difficulty with the medium I'm using with the oil paints. I've been getting headaches, burning nose, itchy hands, and runny eyes. However, I believe I have already come up with a solution: a diluent/medium/brush cleaner by Gamblin that supposedly has no toxicity. I'll see how it works for my next painting, which I think may be of some adorable little Oregon juncos that were at our feeder just outside the window during our recent heavy snow storm. We got some really good photos of them, so I may give one a try for my next painting. There are many other paintings I should be doing, but one of these little birds will give me a bit of a break from the really heavy paintings. I've been seeing pretty good progress in my French language studies, and it's really encouraging. I'm taking classes at Alliance Francaise and really enjoying those. Every novel I read - and I am always, always reading, every single evening for at least an hour - is in French. That helps immensely with my vocabulary. I might add, also, that except for one two-month beginner class in French, many years ago, I had no knowledge of the language at all. Even then, after taking the single summer two-month class at the University of Wyoming, I began struggling with reading novels in French. And it was a struggle, too: I read with my book in one hand and the dictionary in the other. I didn't even have any comprehension at all of sentence structure, my vocabulary was in the low hundreds of words -- well, you get the picture. It was bad. But I really, really wanted to learn the language, and I could at least get the basic gist of whatever it was I was attempting to read. When I went to live in France the first time, in the 1990's, that's the level at which I was 'NOT' speaking. In other words, I was completely helpless and pretty much understood nothing and could only say sentences like "my name is . . .," and "where is. .. ." - but I couldn't understand the answers. So in the very beginning, the person talking to me and I did a lot of hand gestures. More than one person speaking, forget it; I understood nothing and found my mind wandering elsewhere. But I kept struggling, and by the time I left, around a year and a half or so later, I was at least slightly communicating -- getting by, in other words. While there, I studied a French grammar book every evening, kept flash cards with me at all times, very, very shyly tried to speak with people I worked with, and had to speak with service people in shops, etc. It was tough, tough. Over the intervening years, my interest in studying French has waxed and waned -- and is fiery hot now, of course. And I've finally found one thing that really is seeming to work for me now: at the suggestion of my Alliance Francaise instructor, I subscribed to the French language TV channel (TV 5 Monde), and I've started doing some paintings in my bedroom - where my TV is located - as I've mentioned before. While I paint, I have the TV going constantly, where I'm totally immersed in hearing the language, even if I'm not really paying attention. I find myself later, however, telling my daughter about something interesting I heard on the TV during my painting times. As anyone who has studied another language knows, the last thing to come is speaking, and that's the case with me. My vocabulary is very extensive now, I hear and understand most everything, but I'm still very hesitant about speaking. My Alliance Francaise classes help with that a lot because that's what they emphasize, is speaking. And with that and with hearing the TV French constantly, I'm beginning to speak more freely now, too. There is hope, in other words. Sorry, this photo is a bit blurred and has some real lighting issues (I'm painting this one in my bedroom instead of in my studio, and the lighting isn't as good in here.) Why in my bedroom? Two main reasons: One, I do mostly acrylic paintings in my studio at this time, and I don't like to have the two media in the same place.) Two, I like to have a painting nearby sometimes so I can see it even when I'm not actually working on it; I look at it as I do other things during the day and see things that need working on. I don't do this all the time because it becomes a bit of an obsession. I study it before going to bed and will actually jump out of bed, turn on the lights, and fix whatever I saw wrong with it. Not at all good for getting a good night's sleep! But sometimes I like to do it. Below this in-progress photo is the photo I'm working from. Yes, I do get a bit "photographic" in my paintings sometimes, but it's a bit fun to do so from time to time. Okay, got it! 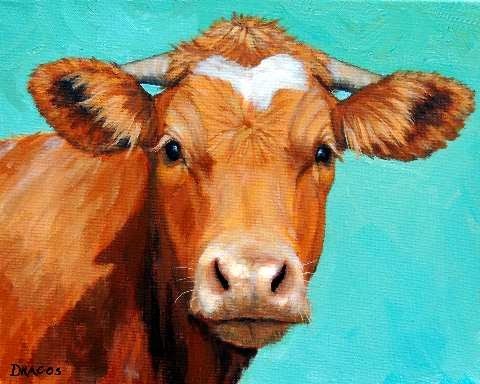 ... in a way -- Again, "Two Cows Revisited"
Google Chrome is giving me problems again. I love it, but it really has a lot of bugs, especially in the last few months. I'm writing this time from Windows Explorer. 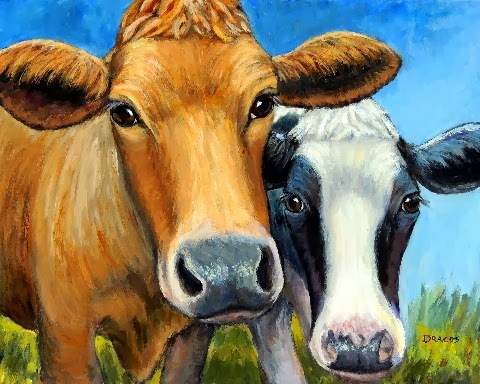 Some time ago I painted these two beautiful girls on just an 8x10" panel. I've always loved the painting, but the original was just too small. (It has sold, by the way.) So I decided to do another similar painting, but this time it's a 16x20" on stretched canvas. It is at this time for sale, along with prints in various sizes. 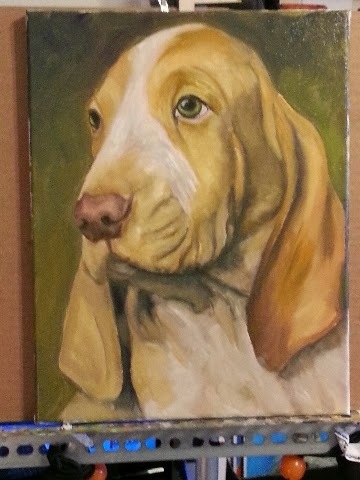 I'm also working now on a precious Italiano Bracco puppy painting. 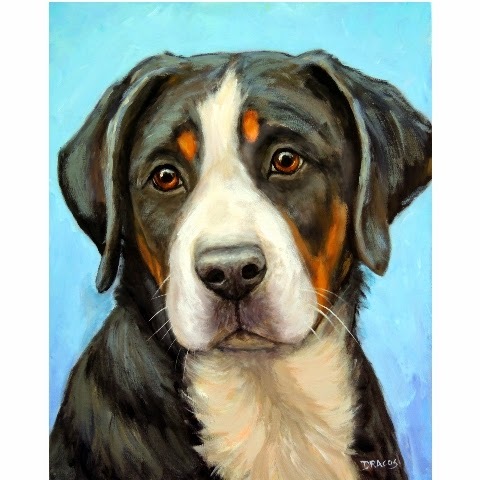 I'm working from photos given to me by someone who was showing this particular puppy at the Rose City Classic dog show a few years ago. If you are that person or know that person, I'm so sorry, but I said I would contact you when the painting was done, and I have lost your name. I know it's been years, but I do eventually get to most all the paintings I have told people I would paint. I'll be doing a progress series of shots on the painting, I've decided; but I have already gotten a bit into the painting before I decided to do so, so there won't be a whole of progress to show. The process is just too beautiful not to share on this particular painting, though. (Hope I don't jinx myself!) 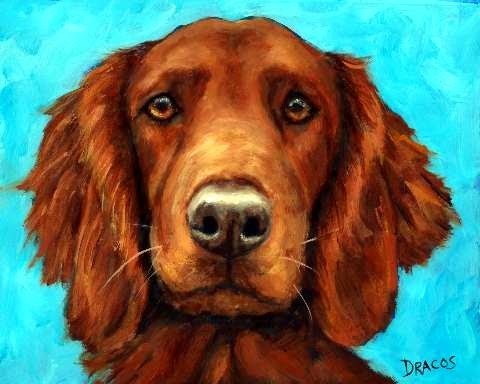 The pup is beautiful, the photograph is excellent, and for some reason, I'm working well -- that's a bit of a change from the difficulties I've been having on some other paintings lately that aren't ready to see the light of day yet! I'll post the pics very soon of this little guy. NSomething is wrong with Blogger. I can't see a word that II'm typing, and there's no way to upload a photo. I guess I'll have to check with Google. I need this blog. I noticed afew ddays ago (sorry if I'm flubbing up; I really can't see a single thing I'm typing) I noticed, again, a few days ago that when I tried to post, I couldn't. I thought it was a passing thing. Now I'm really concerned. I'll see what I can do; don't know if this is posting or not.